System wide hotkeys can be used from any application. Their main purpose is to launch other programs. Program specific hotkeys allows you to define keyboard macros that will send keystrokes to a specific application. Note that at least one control key will need to be defined. 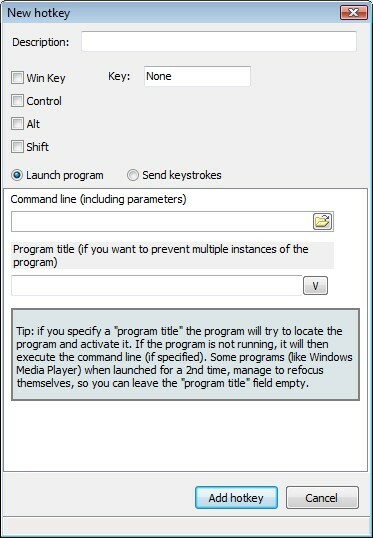 1. check only the checkboxes "Control" and "Alt"
f) Optionally specify a program title. If specified this will prevent multiple instances of the program to be open simultaneously. 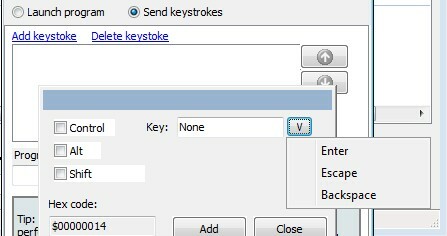 e) Press "Add keystroke" to add a sequence of keystrokes to be sent to the program you want. f) Specify the program to accept the keystrokes.